Many on the highways and byways of the country will no doubt have seen the fruit of Adverta’s labours. 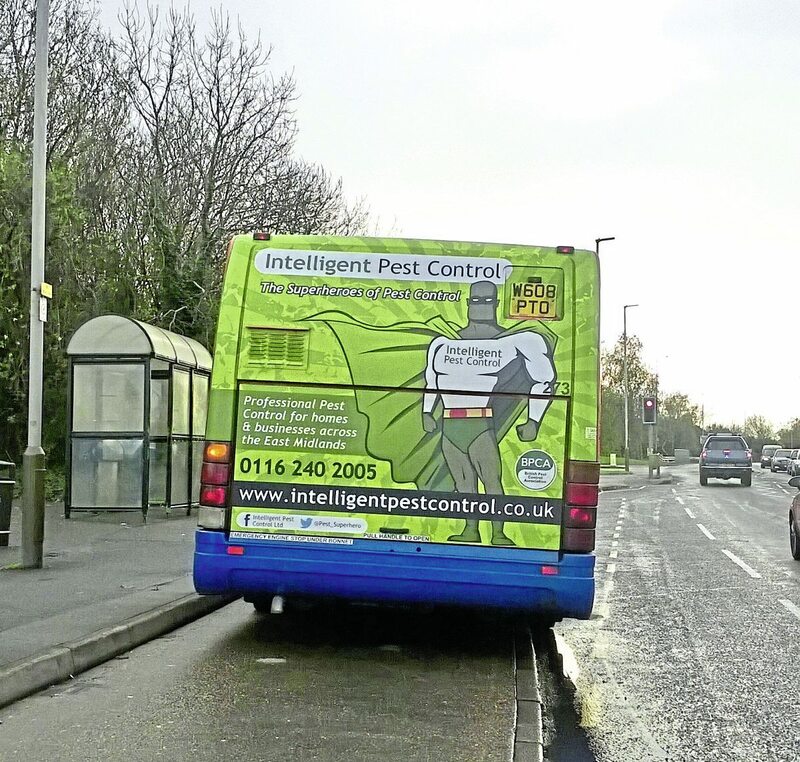 Whether it is making them aware of the latest movie or the local college’s courses, commercial messages sourced and placed by the transport advertising specialist are presented on buses across the nation. Chris Peat met with Mike Terry and Nicky Dodd of the agency to discuss this interesting area. There is one place in particular where you are highly likely to see adverts sourced by Adverta: Nottingham. 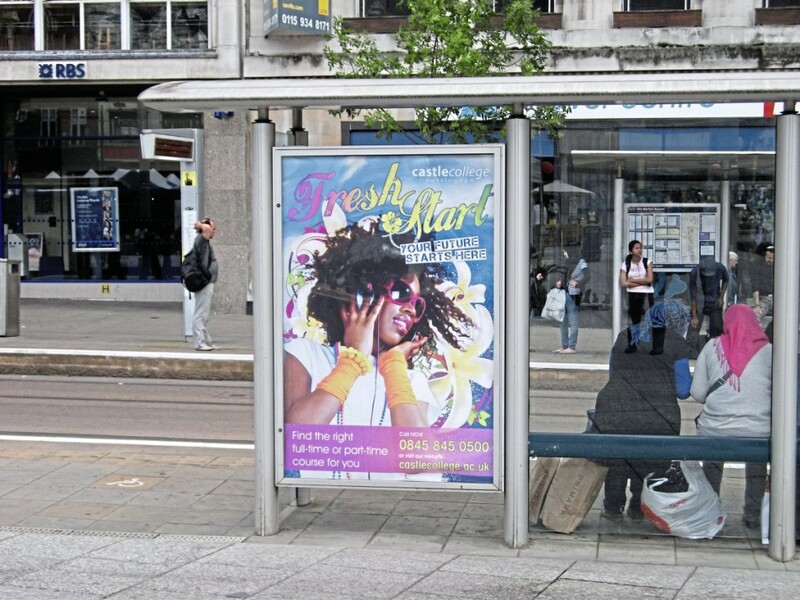 One of the city’s main operators, Nottingham City Transport (NCT), is one of the company’s top clients, sourcing all of its on-vehicle advertising. It has had a contract with NCT since 1991, making it one of its earliest customers. Having been in the bus industry for nearly 20 years, Mike said the business certainly knows the issues and challenges in this area, as well as how to best serve operators. Over the years though, Adverta has had a number of name changes. Its origins are over 20 years ago under the name Decker Media. However, this company was acquired in 2004 by AdBus, which was followed by another buy-out by Titan Outdoor in 2006, forming Titan Bus. In 2010, Lisa Ratcliffe, Adverta’s MD (then Finance Manager of Titan Bus) and the late Roger Fernley (then MD of Titan Bus) instigated what was to become a successful management buyout. The company became Ratcliffe Fernley Media, which trades under the name of Adverta. Mike said the company offers the complete package, providing advertising on any position on a bus, whether that is the T-side, the rear, the bulkhead or even as a whole vehicle wrap. Mike said its pricing is affordable to local businesses, which should help attract advertisers from the area a route operates. As well as working with operators to source advertising, it also offers a vinyl and sign writing service. It can take care of producing all adverts, as well as their fitment. This part of the business is based at its Nottinghamshire offices, which is in addition to its other site in Ripon, North Yorkshire. However, the company tries not to be too stringent. Mike said he would not necessarily turn down a campaign, saying: “I’m always mindful of keeping an open door and not making judgements on behalf of our operators if we are unsure”. A lot of its trade comes from outbound sales. Social media is one way it now achieves this, having a lot of interactions through this channel, in particular with smaller companies. Also on the likes of Twitter and Facebook, it runs a Campaign of the Month, where on-road images of bus advertising campaigns are photographed and posted online. It helps generate a “good feeling” for this kind of advertising, said Nicky. The company interacts with operators through Twitter too, not just advertisers. A misconception of bus advertising, in Nicky’s experience, is smaller companies think it is out of their reach, too expensive. Engaging with them via social media should help dispel these thoughts. One of Adverta’s biggest USPs, Mike said, is its bespoke offerings. He said: “Customers will be treated the same regardless of how many buses they run. We like working with small independent bus operators, as well as larger concerns. “What else sets us apart is we have good quality control measures. We are very conscious about checking things, that they don’t slip the net and an advert doesn’t stay up longer than it should.” Mike, as with the rest of the company, has a strong customer service ethos, another factor he believes sets them apart and this can be seen in the many complimentary testimonials they receive. This care extends throughout the operation, whether it is in its furthest northern customer in Durham or its furthest southern operator in Essex. Adverta tends to be Midlands heavy, but the company is always open to expanding into further areas. It is not just about developing geographically; it also looks to grow technologically. Mike notes there have already been a number of trials of new equipment, including digital advertising and the use of wifi to open up the opportunity of running advertisements on people’s mobile phones. The latter is something the company is looking at rolling out. The chance to offer advertising on the back of tickets is also a possibility. Bus advertising is not without its challenges though, with one issue being rural routes, where buses pick up more road dirt, marring advertisements’ appearance. Adverta conducts regular checks and works with operators to ensure this doesn’t become a major issue. Incidentally, vehicles running in cities tend to earn more revenue from advertising, Mike said, simply because they run more frequently, with more people seeing them. Adverta continues to gain ground in its market, but this is not surprising considering how much it markets itself. 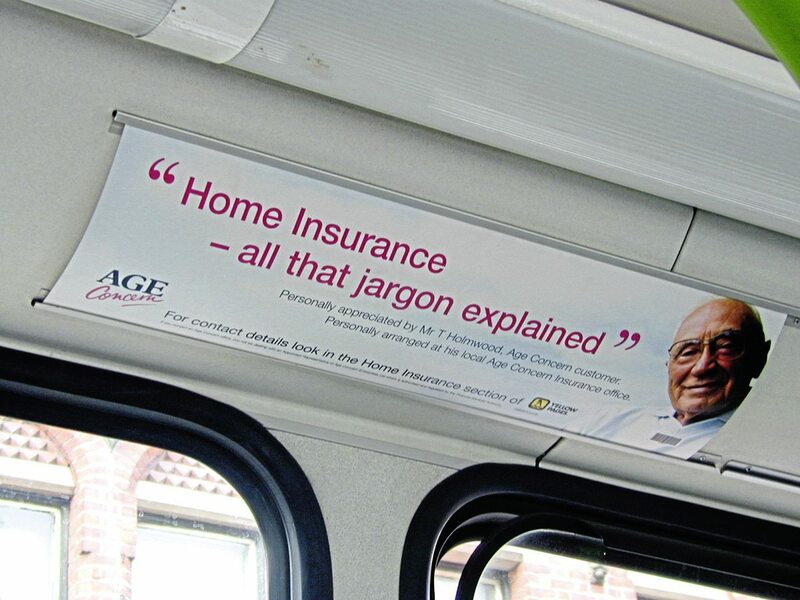 However, even though it has gone to lengths such as promoting its bus advertising on buses, Mike says word of mouth is still important in getting its message out. Having good relationships with its operator clients and advertisers is also key to the goal of helping you earn more revenue from your fleet. Social media is important to Adverta’s strategies. For instance, an impressive stunt it pulled was posting an image of one of NCT’s buses featuring an advert for the film Batman versus Superman. 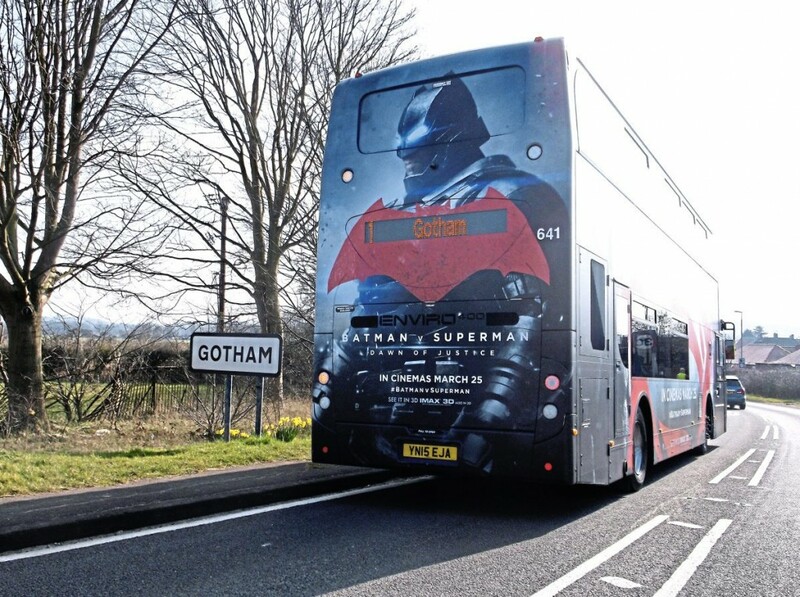 The vehicle was parked beside a sign for Gotham near Nottingham, which shares its name with the fictional hometown of the Caped Crusader. Nicky said it gained a lot of interest, both for the campaign and NCT and it saw the number of enquiries into Adverta soar.